Flanagan finished his rookie season with one catch for 14 yards in three games. Analysis: The undrafted rookie out of Pitt didn't survive the preseason in Washington but eventually joined the 53-man roster when Jordan Reed (foot) and Vernon Davis (concussion) were unavailable in December. Flanagan will need to battle for a roster spot in 2019, presumably hoping to land a job as a blocking-focused No. 3 tight end. Flanagan signed a contract with the Redskins on Saturday. Analysis: Flanagan signed with the Redskins as an undrafted rookie in May but failed to survive roster cutdowns. 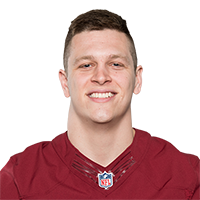 The 23-year-old rejoins the team with starting tight end Jordan Reed (foot) ruled out for Sunday's game, and should serve as the team's No. 3 tight end while Reed is sidelined. There are no videos available for Matt Flanagan. Click here to view all videos.